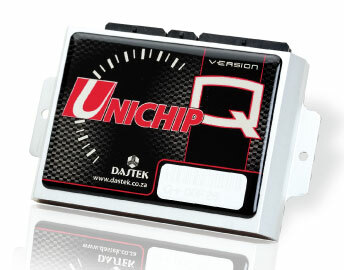 Manufactured by Dastek, South Africa, the Unichip is a highly developed, fully remappable, state of the art, piggy back performance ECU, which works in conjunction with a vehicle’s original engine management system to enable the engine to be custom mapped. Each Unichip is programmed individually to your vehicle. No other vehicle will have the same map, also the Unichip is fully adjustable whether it’s a simple change of parts or a whole new car. You only need a new map, not a whole new unit. Every engine requires optimised ignition, air fuel ratios (and where applicable) boost at all engine RPM points and load conditions. The Unichip allows access to, and ability to adjust and optimise both the ignition and fuelling on a car, allowing precise control over engine performance. 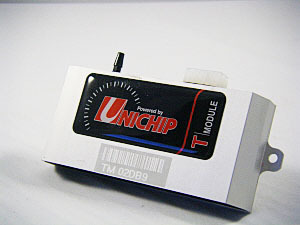 With 17 RPM sites between 500 and 10000rpm and 12 load sites between zero and wide open throttle position built into the Unichip’s software, this equates to 204 possible points of adjustment for fuelling alone, with a further 204 for ignition timing. The Unichip can easily be removed from the vehicle and is also invisible to diagnostic scanners and can not be cleared by main dealer servicing which can delete certain chips/flashing. Power gains on average of 7-12hp for N/A engines, 20-60hp for turbo engines and similar increases in torque figures. Power gains vary on make and model of vehicle, however no other chip can offer you more. In most driving conditions, the Unichip will improve fuel economy. Many modern fuel injected vehicles waste fuel by running very rich air / fuel ratios at part throttle openings. With the Unichip, it is a simple procedure to correctly optimise the air / fuel ratio to maximise fuel economy for cruising and part throttle running. *please note some forced induction cars may need a 3 port boost solenoid fitted at extra cost.